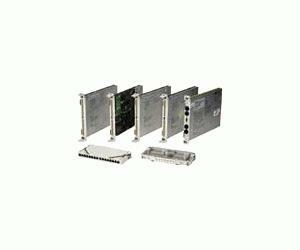 The VXI Technology VT1563A and VT1564A digitizers are C-size, single slot, register-based VXI modules. They are ideal for measurements in electronic production test and electromechanical design characterization, particularly in environments with high levels of electrical noise. Engineers and technicians in manufacturing test, product development, and engineering research test groups can fully characterize electronic and mechanical transient waveforms with these highly accurate digitizers. Each channel of the digitizers has its own analog electronics, including 800 kSample/s 14-bit A/D converters and independent channel isolation. The VT1563A channels have switchable 25 kHz input filters and the VT1564A channels have four (4) selectable input filters. The digitizers are configured for PC SIMM memory, scaleable from 4MB to 128MB. The large memory can easily capture transients and act as a FIFO to allow continuous digitizing while unloading data with block mode transfers.